Editor’s Note – “The Young Boy” Case Lowe reviewed the opener, TJ Perkins vs Cedric Alexander. Joe Lanza missed the match due to technical issues. Gulak called out Thatcher, who he faces tomorrow for the title. Thatcher tried to hit the ring, but was attacked from behind by that sneaky, dastardly bro Matt Riddle. This is a big weekend for Thatcher, who has seen his stock drop this year with some bad performances while the rest of the roster has thrived, and in many cases, blown right past him the eyes of the fans. Matt Riddle is Exhibit A of the latter point. Riddle will run away with any credible Rookie of the Year award, and will earn plenty votes for Wrestler of the Year. His performance here was a good example why. The story was Thatcher, the veteran shooter, finally putting the cocky rookie in his place, battering and stretching him with Riddle having no place to go, unable to break holds with rope breaks or escape to the floor due to the No Holds Barred stipulation. In a match like this, with very little give and take and Riddle barely showing any offense, selling is vital and Riddle’s selling was elite level, whether screaming in pain as Thatcher punished him, collapsing in a heap, or struggling to pull himself up to his feet. This was a dominant win for Thatcher, who came off like a vicious killer with no mercy, enhanced greatly by Riddle who put in one of the best performances of his short career. Rarely if ever do you see rookies who are this good at the nuances of selling, let alone with the ability to get their character over and connect with crowds the way Riddle does. There are veteran wrestlers who I think are excellent performers who lag behind Riddle in both of those areas, which are two of the trickiest skills to grasp in wrestling. Riddle is an absolute prodigy, and this is one of his must see performances. A simple story, with Rhodes working Sabre’s leg, and Sabre working Cody’s arm. 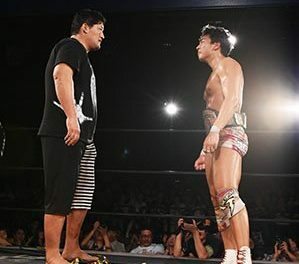 While well worked, this was far from anything flashy, never hit a second gear, and didn’t have the oomph you would have liked to have seen in Cody’s indie debut. A key moment was Sabre kicking out of the Cross Rhodes, which combined with Rhodes finishing Sabre with his new leg lock submission (called “American Nightmare”), was symbolic in Rhodes moving forward and putting the past behind him. I can’t call this a bad match, as it was well worked and everything was logical, but the finish was sudden and flat, and it was hardly a “busting through the gate” type performance for Rhodes. This was the worst EVOLVE show I’ve seen this year. This is not to say the show was bad, because it wasn’t. EVOLVE has set themselves a high bar, earned with incredible show after incredible show, many of which were Show of the Year caliber. The double edged sword of setting that bar, is that you aren’t going to continuously clear it. With that said, this was a decent show top to bottom, with one must see match, and a newsworthy main event that is also worth a watch for that reason alone. This would be a solid show for most promotions. For EVOLVE, it was a letdown.